The Tutor : THE TUTOR - see it in September in NYC! THE TUTOR - see it in September in NYC! We are so pleased to announce that Prospect Theater will be presenting a special showcase production of THE TUTOR, for 16 performances only, at 59E59 Theatres. Our run will be in conjunction with the 2005 New York Music Theater Festival. THE TUTOR opens Sept 10 and closes Oct 2. Watch this space for casting news, press, special events, full performance schedule and to find out how to buy tickets. With a winning mix of clever wit and surprising warmth, THE TUTOR tells a fresh, funny, contemporary tale of romance, art, and what it really takes to get into Princeton. When a struggling young novelist takes a job tutoring a sullen Manhattan girl, he thinks he's just out for quick cash. But when the characters in his novel start to come to life, and his teenage pupil begins to open up, his life takes a few surprising turns. This award-winning musical offers inventive, memorable music, vibrant characters, and way more laughs than taking the S.A.T.! 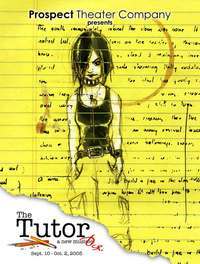 THE TUTOR is a three-time winner of the prestigious Richard Rodgers Award, which is administered by the American Academy of Arts and Letters.